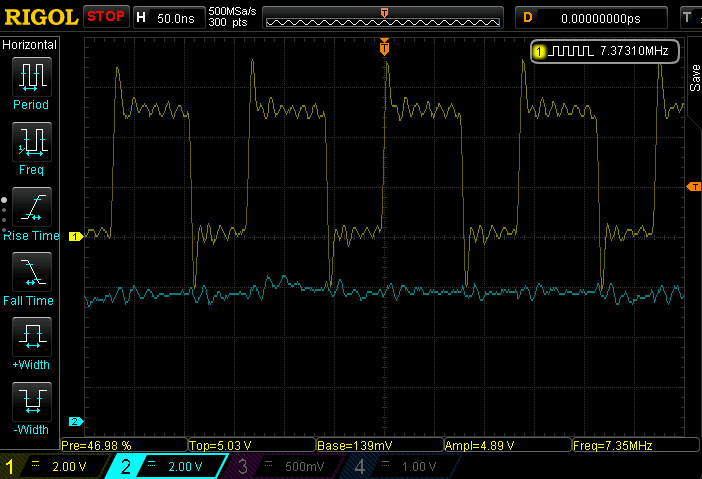 If you have access to an oscilloscope then this can help greatly in troubleshooting a non-running RC2014. I’ve made the assumption that you have a reasonable idea how your scope works, so will gloss over the details of how to set things up. Although the screen shots that follow were taken on a 100Mhz 4 channel digital storage scope, even a basic 10Mhz 2 channel analog scope will be able to give you the same kind of info. If you probe the TX line and trigger from the reset line going high, you should see a burst of signal from the TX line just after releasing the reset button. First shot above is taken at 10ms/div. When zoomed in at 200us/div you can see the individual pulses on the Tx line. This is the ASCII for “Z80 SBC By Grant Searle. Cold or warm boot” welcome message. If you get this, then your RC2014 is working and executing code, so any problems are going to be serial related. For completeness, the following traces are for each of the pins on the RC2014 expansion bus. They are captured at 2v/1us per division and labelled according to the pin function. This is after power has been applied and the reset button has been pushed, which should leave the RC2014 is a consistent stable state. The traces above are representative of what you can expect to see, and indicate the level of activity on any particular pin. The don’t necessarily represent the exact value that you will see. If you have something that varies a lot, for example a lot of activity on A13 or TX continuously low, then that indicates where you want to focus your attention on.